As a rule, Americans like their houses big. The United States Census Bureau reports that in the year 2014, the average size of a new house in the U.S. was more than 2,400 square feet. American houses have more than twice as much space as British, Italian, or Japanese houses, and three times as much as those in Russia or China, according to the environmental website Shrink That Footprint. Yet even as typical new houses grow larger and larger, some Americans are bucking the trend. They’re choosing to live in houses with no more than 500 square feet of space – less than one-quarter the size of the average new house. 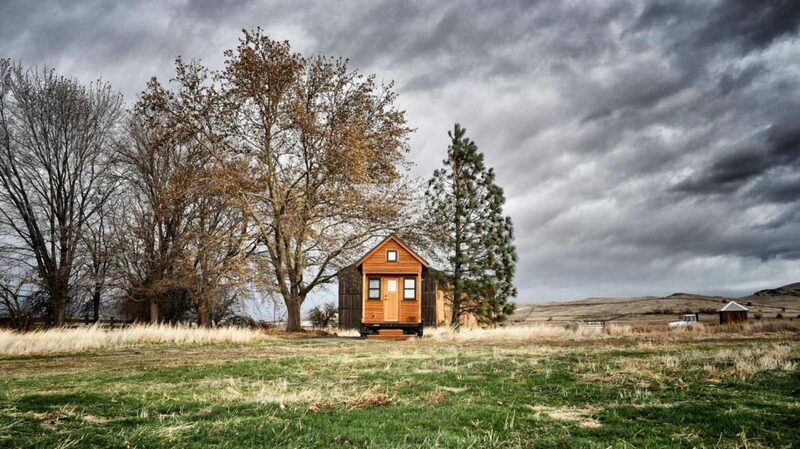 This is the tiny house movement, and it’s a big deal. There are three TV shows dedicated to tiny house living – “Tiny House Hunters” and “Tiny House Builders” on HGTV, and “Tiny House Nation” on FYI – as well as a movie called “TINY: A Story of Living Small.” Tiny houses have been featured in Country Living, The New Yorker, and YES! Magazine. The phrase “tiny houses” gets more than 240,000 searches on Google every month. People have all kinds of reasons for choosing to live tiny. Some are looking for ways to own a home without a mortgage, some want a house they can take with them wherever they go, and some are just trying to tread more lightly on the Earth. Whatever their reasons, they’re part of a growing trend that’s gradually changing the way Americans talk – and think – about home. Tiny houses come in a wide variety of shapes and styles. A tiny home can be a log cabin in the woods, a luxurious waterfront cottage, or even a repurposed shipping container. Tumbleweed Tiny Houses. 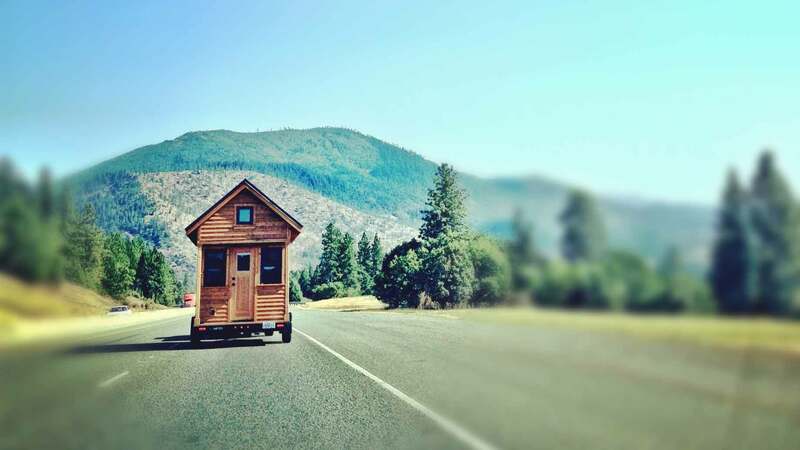 One of the best known manufacturers of tiny houses is the Tumbleweed Tiny House Company. Its four basic house models all have wood exteriors, some rustic in style and some modern. They range in size from 117 to 221 square feet, and all of them are mounted on trailers for towing. Buyers can have a house built to order or buy the plans and build their own. Tiny Texas Houses. Owners who want something a bit larger and more permanent can try Tiny Texas Houses. These come in two sizes, 240 or 336 square feet, and are built entirely out of salvaged materials. Designed in a casual, rustic style, these houses are built in Luling, Texas and then shipped to the buyer’s site and installed. Shipping Container Homes. Another type of salvaged material used in tiny houses is metal shipping containers. 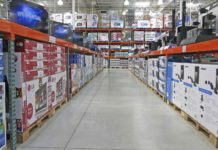 Once these have served their purpose – carrying goods from one location to another – it usually isn’t cost-effective to ship them back empty so they can be reused. Rather than letting them end up as scrap metal, tiny house manufacturers transform them into modern-looking prefab homes. One example is the G-Pod, which contains all the materials necessary to build the house inside a container that can be shipped, unpacked, and assembled on-site. Tiny Luxury Homes. Although tiny houses are small, they don’t have to be simple. A story in Forbes features tiny luxury homes, tricked out with amenities such as home automation, surround sound, radiant in-floor heat, and tiny hot tubs. Although these houses are very expensive when priced by the square foot, they offer an opportunity to own a luxury home for as little as $35,000 – less than many luxury cars. Micro-Apartments. Some tiny homes aren’t even houses – they’re “micro-apartments” for rent. These tiny apartments – usually less than 400 square feet – offer single people just starting out the chance to afford a place in the city, where the rent on a full-sized apartment would be out of their price range. Micro-apartment buildings tend to feature amenities such as shared space for entertaining and storage, which help make up for the tiny size of the apartments themselves. Tiny houses take the pros and cons of small house living to their extreme. Compared to the average house, or even a more normal small house, a tiny house gives you less of everything: less space, but also less expense, less maintenance, and less energy use. On top of that, tiny houses have a whole extra set of unique benefits and problems related to their extremely small size. They can go places a regular house can’t – but in many communities, they can’t stay in places where a regular house can. Lower Expenses. A tiny house costs a lot less to build than a full-sized one. According to The Tiny Life, it’s possible to build a tiny house for $23,000 on average. The average price for a full-sized house, by contrast, is $272,000 – more than 10 times as much. Cutting back on housing expenses enables tiny house owners to put more money toward luxuries (such as travel), save for retirement, or simply work less. No Mortgage. Most people can’t afford to buy a house without taking out a mortgage, which only adds to the long-term cost. A 30-year mortgage at 4.5% interest raises the overall cost of the average house to $482,000. The Tiny Life reports that 68% of tiny house owners own their homes free and clear, as compared to just 29% of all homeowners. Lower Energy Use. Tiny houses don’t just cost less upfront – they’re also much cheaper to maintain. Bills for electricity, fuel, water, and waste disposal are all much lower. In addition, it’s much easier to live off the grid in a tiny house, since you can heat the entire space with a small wood stove and power it with a small solar array. Many tiny houses even have composting toilets, which break down waste without needing to be hooked up to a sewage system. Freedom of Movement. A tiny house has a small footprint, so it doesn’t require a large plot of land. In addition, many small houses are built on trailers, so their owners can take them along whenever they move to a new city. For many people, this is a way to enjoy a life on the road without giving up all the comforts of home. Easier Maintenance. A tiny house is easy to take care of. With less space to clean and fewer appliances to repair, tiny house owners can spend less time on chores and more on their work, hobbies, and relationships. Harmony With Nature. The tiny house movement goes hand in hand with the environmental movement. Tiny houses require less material to build and less energy to power. Also, their small size makes them easier to site in a place that’s close to nature. A Simpler Life. A tiny house doesn’t have room for any kind of excess stuff: bulging wardrobes, elaborate electronics, and huge libraries of books and videos. Tiny homeowners pare their belongings down to the essentials, keeping only the items that truly enrich their lives. Living in a tiny house isn’t completely idyllic. Any home with less than 500 square feet of space has a few obvious drawbacks – and a few others that are less obvious. Less Living Space. A tiny house doesn’t have room for a full-sized luxury kitchen or bathroom. Tiny house owners often have to make do without a bathtub or full-sized kitchen appliances, unless they’re willing to sacrifice other space for them. And while a tiny house makes a comfortable home for one or two people, it can get crowded with a whole family sharing such a small space. It’s especially difficult for families with teenagers, who want more privacy for doing homework and hanging out with friends. Less Storage Space. For most families, moving into a tiny house means getting rid of a lot of belongings, and not all of them are unnecessary junk. Episodes of “Tiny House Nation” show downsizing families reluctantly giving up some of their favorite possessions: kids’ toys, home brewing equipment, exercise equipment, and most of a prized shoe collection. One couple even has to give up two cats they’ve had since before they were married, because the cats can’t live peacefully together in such a small space. Limited Entertaining Capability. It clearly isn’t possible to host a Thanksgiving dinner for 10 people when your table can barely seat four, or have your in-laws come to visit when there’s no room for an extra bed. Many tiny house owners try to make up for these problems by adding more outdoor living space, such as a hot tub or a deck for picnics. 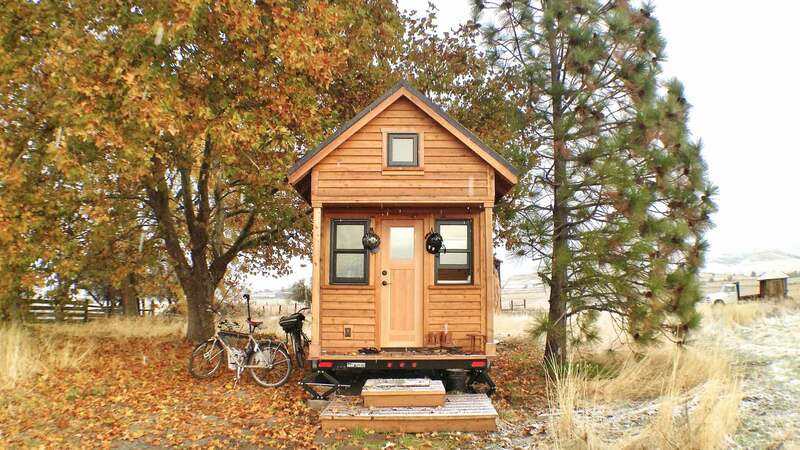 Some even build a second tiny house to use as a guest cabin. Zoning Rules. Although a tiny house doesn’t require much land, many towns make it difficult to build one. Zoning laws often include a minimum size for dwellings, and a 200-square-foot tiny house isn’t usually big enough to make the cut. To get around these rules, some tiny house owners buy a full-sized house, rent it out, and then park their tiny houses in the backyard as either “outbuildings” or “vehicles.” Trailer parks can also provide a home for a tiny house. Financing. For those who can’t afford to buy or build a tiny house for cash, getting a loan is more challenging than it is for other home buyers. It usually isn’t possible to take out a standard mortgage loan, because banks don’t consider a tiny house to have enough value to make good collateral. Some tiny house buyers are able to finance their houses with personal loans, while others borrow money from friends and family members. Another approach is to spread the cost out across several credit cards, but this means paying much higher interest than you would for a regular mortgage. Tiny houses appeal to a surprising variety of people. Some tiny house owners are single, while others share their tiny homes with their partners or families. Some live out in the country, some park their tiny houses in town, and some cluster together in tiny house communities. Their stories illustrate the wide variety of reasons people have for living tiny, and the wide variety of benefits they get from the arrangement. Ryan Mitchell, who runs The Tiny Life, lives in a 150-square-foot house in Charlotte, North Carolina. He built the entire house with his own hands, working nights and weekends over the course of about a year. Even though he had no previous experience with construction, the only parts he hired a professional for were the roof and the electrical system. Mitchell’s house is parked on a 32-acre parcel of land in the city, which he leases from a friend for a nominal fee. He keeps it tucked out of sight in the woods, since it’s technically illegal for him to keep it there; after several rounds of back-and-forth with the authorities trying to get a building permit, the local code enforcement officer finally advised him to take a “don’t ask, don’t tell” approach. The house is mostly off the grid, with propane appliances, solar panels, a composting toilet, and a greywater system to process the waste water from the shower and sink. The only utilities he receives from the city are his water and cable internet. Two families interviewed in YES! Magazine talk about the challenges of sharing a tiny house with kids. Kim and Ryan Kasl of Minnestota share a 207-square-foot tiny house with their two children, ages six and four. Ryan says the kids absolutely love their tiny home and have had no complaints about giving up their bedrooms and many of their toys. The Kasls’ tiny house is not only their home but also their kids’ school. Kim says having less work to do at home gives her more time for teaching, and the small space forces her to be more creative in her choice of activities. The kids’ education includes nature walks, field trips, visits to the children’s theater and science museum, and visits to relatives who teach them about sewing, construction, and raising animals. 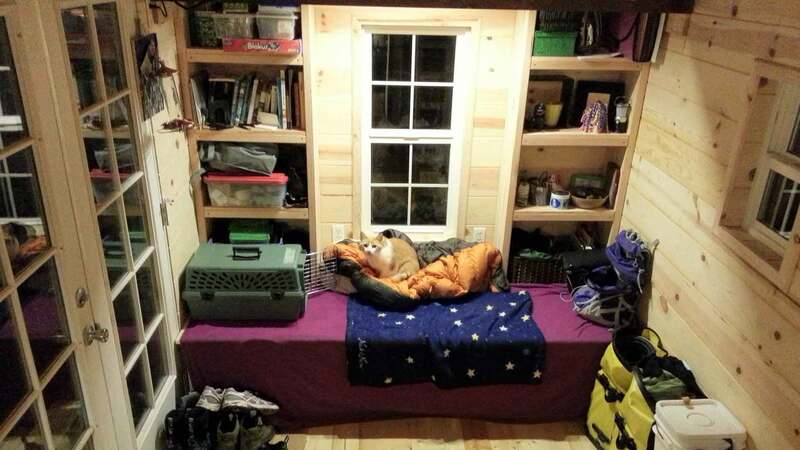 The other family, Andrew and Gabriella Morrison of Oregon, share a 207-square foot tiny home – plus an additional 110 feet of sleeping loft space – with their teenage daughter, Terra. Their son Paiute has moved out, but for a while the four of them shared the small space, and Andrew says it made them much closer as a family. He admits that they have “clashes” like any other family, but living in such close quarters forces them to communicate and work through them. It also helps that the house has “guest cabins” for visitors, allowing the kids to have sleepovers with friends or to enjoy a little private time. Some tiny house owners band together to form tiny house communities, with several houses parked together on a single lot. One example is the Simply Home Community, a group of four tiny houses parked behind a full-sized house in Portland, Oregon. 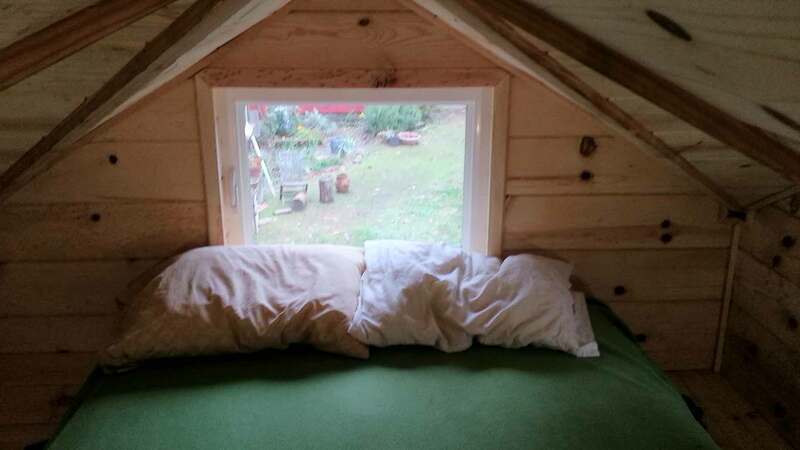 The four owners met through a group for tiny house owners in Portland and decided to shop together for a house with a large yard where they could keep all their “tinies.” They eventually bought a house and went through a lengthy permitting process to extend its plumbing and power lines into the back yard for the tiny houses. The community now includes the four tiny house owners plus three more people who share the main house. As a group, they share outdoor space, including a garden and fruit trees, which they work together to maintain. Tony Diethelm, one of the owners, explains on the Sustainable Cities Collective website how the group “spent many months hashing out community agreements” about such matters as pets and shared chores. The members all get together regularly for meetings and dinners to hash out any problems and keep their collective running smoothly. A much larger community, Quixote Village, comprises 30 tiny cottages spread across a two-acre lot in Olympia, Washington. Owned and managed by a nonprofit organization called Panza, it provides permanent housing for formerly homeless adults, including those with mental and physical disabilities. The village started out as a homeless tent camp, known as Camp Quixote. Eventually it managed to build its permanent home at Quixote Village with the help of a variety of grants and donations, including a cheap $1-a-year lease on the land. Each 144-square-foot tiny house in Quixote Village houses one person, and a larger community building holds a common kitchen, showers, laundry, and meeting and gathering rooms. Residents pay one-third of their monthly income – whatever that is – in rent and share responsibility for maintaining the village’s common areas, including a vegetable garden and a berry patch. They continue to live by a code of conduct they established back in their Camp Quixote days, electing their own leaders and holding regular meetings and community dinners. Not all tiny communities are equally successful, however. Boneyard Studios in Washington, D.C., was a tiny house “showcase community” with three tiny houses parked on a 0.9-acre lot behind a graveyard. This community had legal problems from the start, as the city would allow the tiny houses to park in this legally “nonbuildable” lot but wouldn’t recognize them as official residences. Eventually, according to NPR, the three owners “had an ugly falling out” and separated, although two of them still hope to reassemble their tiny house community in a new spot. If you’d like to see plans of actual tiny houses, you can buy them from The Tumbleweed Tiny House Company, Tiny Texas Houses, or Tiny House Design. Tiny Texas Houses also offers a set of plans free of charge when you sign up for the company newsletter. If you’re more interested in having a house built and delivered to you, you can shop on the Tumbleweed site or Tiny Texas Houses, or check out the list of builders at Tiny House Listings. This site can also help you find existing tiny houses to buy or rent in your area. If you’d like to give tiny house living a try on a short-term basis, you can rent a tiny house for your next vacation. 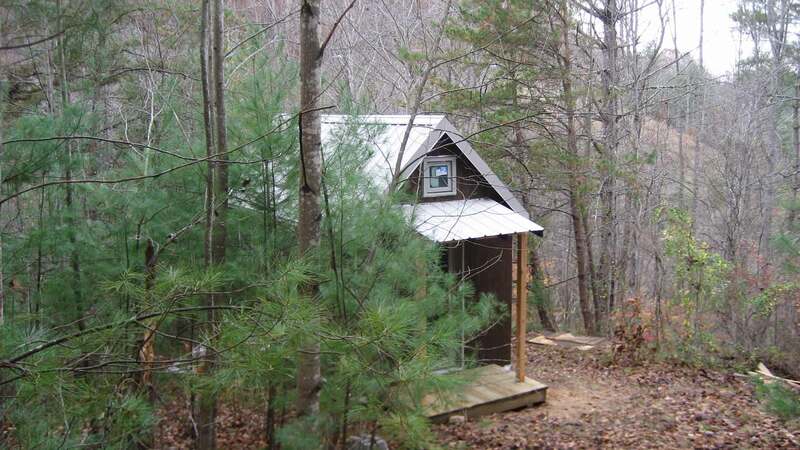 Tiny House Vacations has listings that you can search by type, occupancy, location, or price. Finally, if you want to see some more examples of how people actually live in tiny houses, check out the show “Tiny House Nation” on FYI. Living in a tiny house isn’t for everyone. Anyone who is claustrophobic or is deeply attached to belongings that take up lots of room won’t feel comfortable in a space this small. And of course, the bigger your family, the harder it is to live together in a tiny space – though there are various ways to work around that problem. In general, tiny living works best for those who are willing to abandon the widespread social ideal that “bigger is better” and replace it with “less is more.” That is, having less space, and less stuff to fill it, means more money, more freedom, and more time for the things that matter most. That’s the ethos of the tiny house movement, and the key to its appeal. Would you like to live in a tiny house?